Our Grade 2AK and 1/2KG students made a cardboard loom and began weaving a variety of threads and materials through the warp threads. that set us going on a whole willage, Tartan Town, with the main street being Weaving Street. on the other . More work is featured on our Recent Student Artwork page. Last night our school held a Graduation ceremony for its Grade 6 students at Luxor Receptions at Sydenham. Four grade 6 classes graduated and again this year the students presented the Principal, Mr. Peter Reading with a mosaic which we created in Art classes. This year’s student designer of the Chinese Year of the Ox Mosaic was BJ Bentley who helped me present the heavy mosaic. The OX is the fifth in a series which is displayed on a wall in our school’s courtyard. 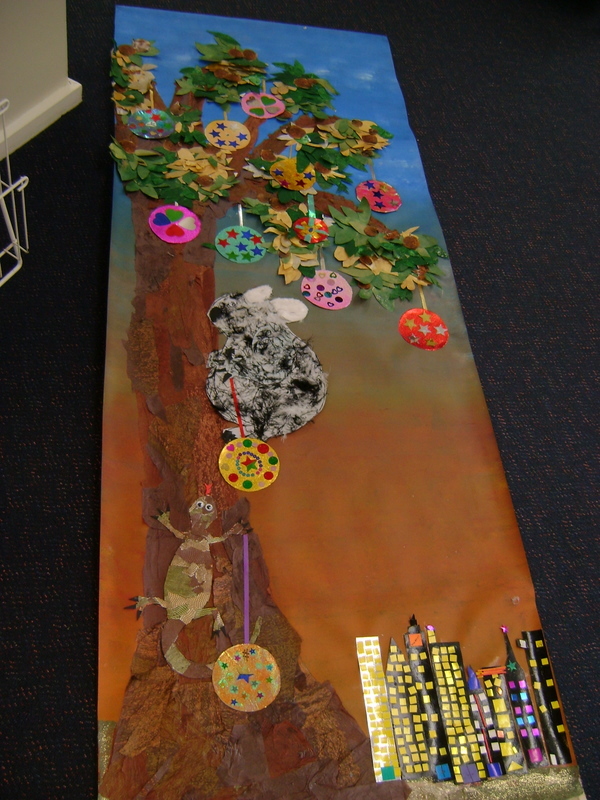 Our Prep (Kindergarten) students looked at the work of Pat Hutchins and her story ” Rosie’s Walk”. Originally published in 1968, this story still appeals to young children and makes an excellent inspiration for a collage picture. 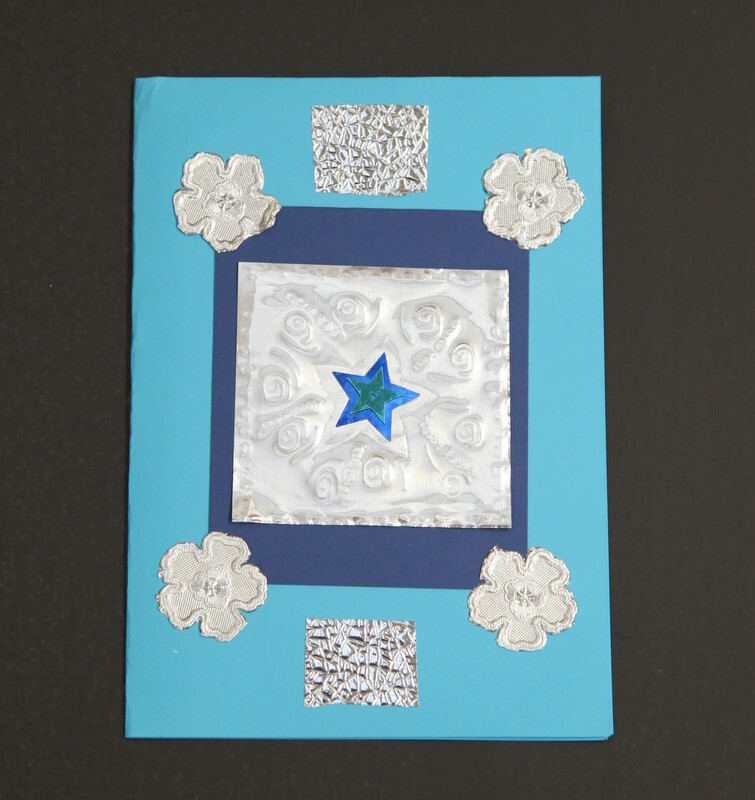 Our Grade 4 students have been embossing using thick aluminium foil and wooden skewers to do the drawing. The students pasted their designs onto folded cover paper to make cards. Melbourne Airport CEO Chris Woodruff. presented our Third prize in the Christmas Banner Competition at a special morning tea yesterday. We were very proud of all three of our Banners. Congratulations to our Grade 5 students. Wonderful News for Taylors Lakes Primary. One of our three banners made by the Grade 5AR students won third prize in the Melbourne Airport Christmas Banner Competition. Congratulations to our talented students and to Mrs Vella for her inspiration and expertise in coordinating the group effort. Well done to all our Grade 5 students too as there were only three prizes available and we know there were many beautiful banners entered. We are proud that two Art teachers and six 5AR students have been invited to the Airport to accept the award at a special morning tea on Tuesday the 8th of December.